At the front of my suburban house, I have a Little Free Library. With an emphasis on children’s books, at any given time, the library has three or four board books, a dozen or so easy readers, twenty chapter books for middle grade readers and twenty five picture books. This is our second year in existence and the library has been a wonderful way to meet neighbors and celebrate community. Many people speak to my husband and me about the library and we have received many generous donations. Throughout the week, I rotate books in and out of the library as I try to keep the selection fresh. This week, while my husband was working in our garden, someone stopped by to donate a new picture book to the library. She explained that her friend, who is an author, had sent it along and asked her to drop it off. This is a “first” for the library – an author-autographed picture book! is a perfect match to the community spirit of a Little Free Library. Nana is a well-known and very popular elementary school teacher. She and her Newfoundland dog often walk through Maplewood Village. They pass local landmarks including a church, a park and the railroad station. Along the route, they see familiar faces and speak to friends. 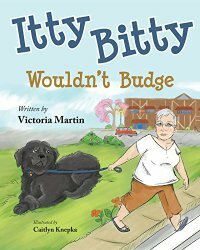 One day, Itty Bitty decides stop partway along the route. She simply does not want to move. Nana does her best to persuade Itty Bitty to finish their walk but she’s a very large dog and quite stubborn. Passersby and community helpers ask Nana if she needs help but Nana knows her best and eventually solves the challenge. I want to thank Victoria Martin and her friend (who lives not far from me) for this donation to our neighborhood library. I know it will be appreciated and enjoyed by many children. Read about the author and the inspiration for this picture book here.